This recipe for Pad Thai noodles with shrimp is authentic and so scrumptious! Once you have the ingredients, the Pad Thai sauce is simple to put together, so don't be tempted to buy bottled or packaged pad Thai sauce, which never tastes as good as fresh. Also, making it yourself means you get to adjust the flavors exactly to your liking. Aside from getting the sauce right, the secret to great Pad Thai is all in the noodles and how you cook them. 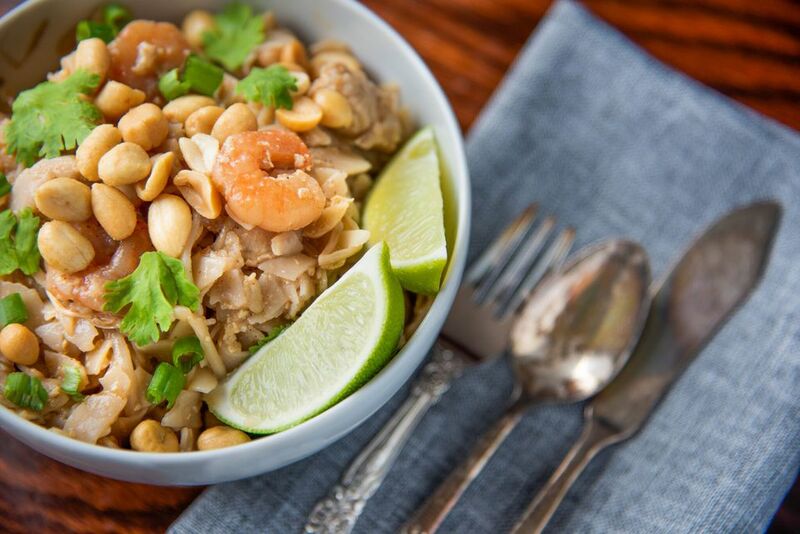 For an easier version of this recipe, see: Quick & Easy Shrimp Pad Thai. Bring a large pot of water to boil, then switch off heat. Dunk in noodles and soak 3 to 4 minutes, or until noodles are limp but still firm and a little "crunchy". Tip: The noodles must remain undercooked at this stage, as they will be fried later. This is the key to chewy ' al dente' rice noodles. Drain and rinse thoroughly with cold water. Set aside. Toss sliced chicken in 1 tablespoon soy sauce and set aside. In a small bowl or cup, combine all 'Pad Thai Sauce' ingredients (note that if your tamarind paste is very thick, only add 1 tablespoon; if thin/runny, add 1 1/2 tablespoons). Taste-test the sauce, looking for a very strong-tasting flavor that tastes sour-sweet first, followed by salty and spicy. Set aside. Warm a wok or large frying pan over medium-high heat. Add 2 tablespoons oil and swirl around, then add the white parts of the onion (reserve green parts for serving), plus garlic, galangal/ginger, and chili. Stir-fry 1 minute. Add chicken and stir-fry 2 minutes, or until opaque when cut through. Add shrimp and continue stir-frying 2 to 3 more minutes, or until shrimp are pink and plump. Push ingredients aside, making room in the center of your wok/pan and crack in the egg. Stir-fry quickly to scramble (30 seconds to 1 minute). Add the noodles and drizzle over 1/3 of the pad Thai sauce. Using two utensils and a gentle turning motion, stir-fry everything together. Keep heat between medium and high - you want it hot enough to cook the noodles, but not so hot that they'll burn. Add more sauce every 30 seconds to 1 minute as the pan/wok dries out. Continue stir-frying until sauce is gone and noodles begin to get sticky and 'glossy' and taste chewy ('al dente' (5 to 7 minutes). Turn off heat. Fold in bean sprouts and taste-test. If not flavorful or salty enough, add more fish sauce. If too salty or sweet, add a drizzle more tamarind or a good squeeze of lime. If not spicy enough, add more chili sauce or fresh-cut chilies. Sprinkle over the green onion, nuts, and coriander, and garnish with lime wedges (to be squeezed over before eating). Thai chili sauce can be served on the side for those who like it extra spicy. When making more than 8 oz. of noodles, double the pad Thai sauce recipe. Avoid making more than 12 oz. of noodles at any one time, simply because as it's hard to turn the noodles and get them cooked evenly without overcooking them. Any leftover sauce can be stored in a jar in the refrigerator for up to 1 month.